Manila (AFP) - The Philippines is closing its best-known holiday island Boracay to tourists for up to six months over concerns that the once idyllic white-sand resort has become a "cesspool" tainted by dumped sewage, authorities said on Thursday. Philippine President Rodrigo Duterte has ordered the shutdown to start on April 26 for a maximum period of half a year, his spokesman Harry Roque said. 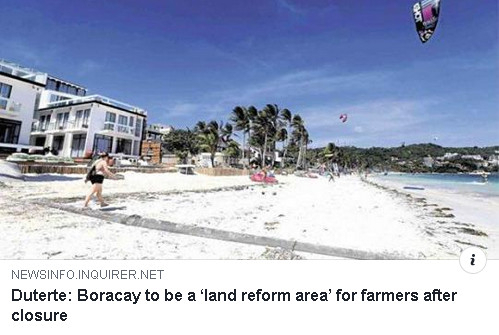 "Boracay is known as a paradise in our nation and this temporary closure is (meant) to ensure that the next generations will also experience that," Roque told reporters. The decision jeopardises the livelihood of thousands employed in the island's bustling tourist trade that each year serves two million guests and pumps roughly $1 billion in revenue into the Philippine economy. Experts said the measure also appeared to contradict the government's own pro-development policy for the island, including the recent approval of a planned $500-million casino and resort on Boracay. The threat of closure first emerged in February when Duterte blasted the tiny island's hundreds of tourism-related hotels, restaurants and other businesses, accusing them of dumping sewage directly into the sea and turning it into a "cesspool". Authorities said Thursday some businesses were using the island's drainage system to send untreated sewage into its surrounding turquoise waters. The environment ministry says 195 businesses, along with more than 4,000 residential customers, are not connected to sewer lines. 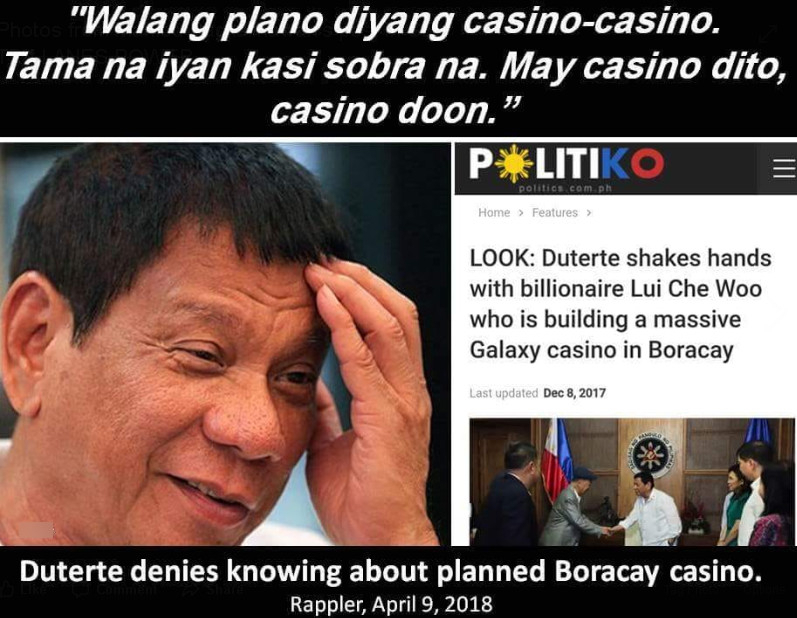 But within weeks of Duterte lashing out at the local businesses, the Philippines gave the green light for Macau casino giant Galaxy Entertainment to begin construction next year of the casino and resort complex. 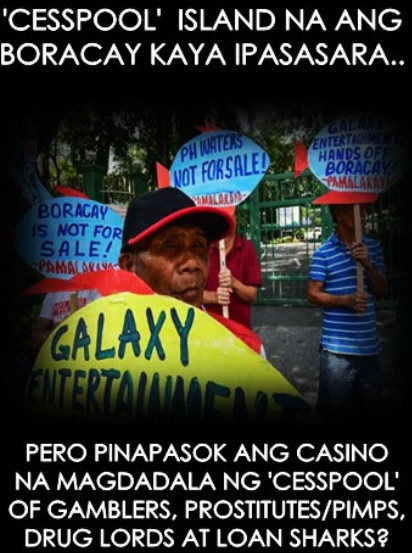 "The casino contradicts all the efforts now of cleaning up and making sure Boracay goes back to the state where it doesn't violate its carrying capacity," former Philippine environment undersecretary Antonio La Vina told AFP. He added that the area has seen "unlimited" development because "local government units and the national government agencies did not do their job of enforcing rules on land use, environmental impact assessment". Authorities said they would use the closure to build new sewage and drainage systems, demolish structures built on wetlands and sue officials and businessmen who violated environmental laws. The impact of the decision was already being felt, with domestic airlines announcing they would scale back the number of flights to the jumping off point to the 1,000-hectare (2,470-acre) island. Malaysian low-cost carrier Asia Air has suspended all of its domestic and international flights to Boracay until further notice. "I am really in a quandary on how to handle six months (of closure)," budget hostel manager Manuel Raagas told AFP. "There will be no income and we have bills to pay so I don't know how I will survive." Officials said they were willing to take a hard line, saying police and potentially even soldiers would enforce the closure. "We will issue guidelines on how to bar tourists from entering starting from the port," interior assistant secretary Epimaco Densing told reporters on Thursday. "Whether foreign or local, they will not be allowed to enter the island." 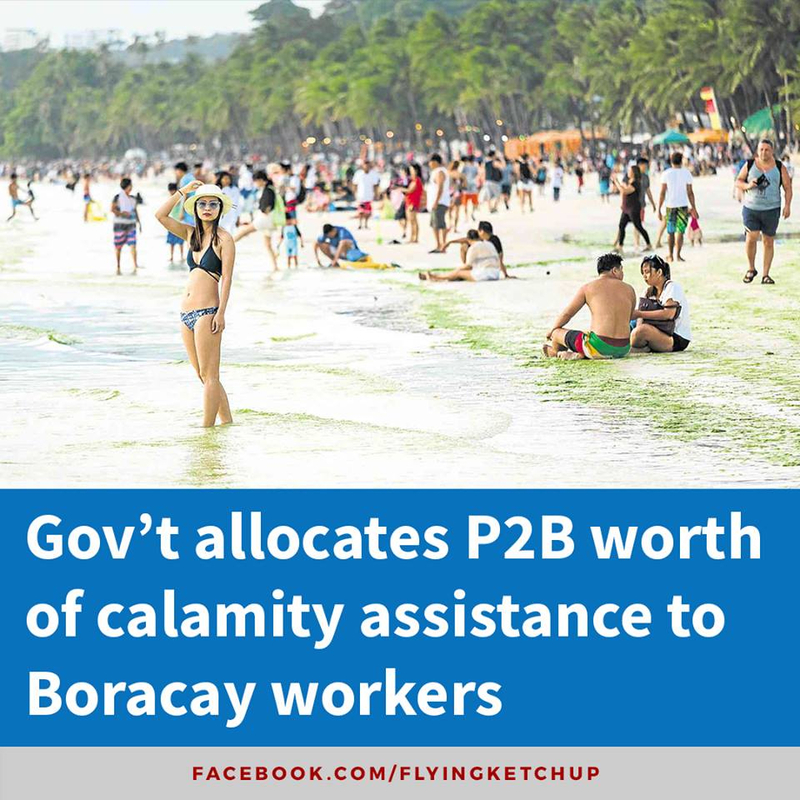 The Boracay Foundation Inc., a business association on the island, had asked the government to shut down only those violating environmental laws. "It's unfair for compliant establishments to be affected by the closure," Executive Director Pia Miraflores told AFP. Miraflores said that even before the ban was announced, its shadow had hit some businesses hard in Boracay. Some couples who scheduled their weddings on the island up to a year or two in advance had cancelled their reservations even before the ban was announced, she said, with tour agents also besieged with client calls on whether to pursue their planned trips. Boracay employs 17,000 people, as well as 11,000 construction workers working on new projects. Who should be responsible for the daily clean-up of this once very famous tourist spot for clean, clear sea water? Should it be the officials of the town? The Department of Tourism? Where did all the tourism money went to? Why can't the officials divide the Boracay resort into sectors and close and clean-up one sector at a time, instead of closing the entire resort and make businesses suffer loss all at the same time. How can you properly restore when you are still allowing a massive influx of tourist even with cleaning up sector by sector. 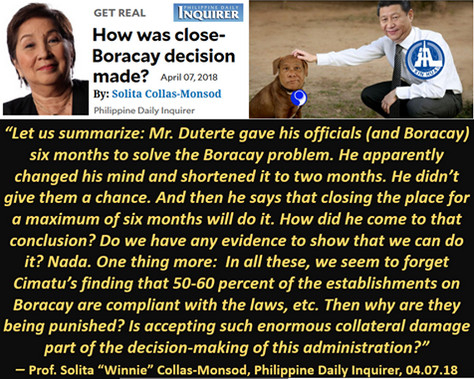 Boracay has been left unattended by the local government for decades, a six month closure is needed or else masisira na ng husto ang isla. Six months? Cleaning and building sewage disposal and treatment infrastructures alone will take more than that! What's more cleaning the ocean water contaminated with sewage would be e avery huge undertaking. Who made the estimate of 6 months for clean-up? Any studies performed? Any statement of what will be done and accomplished in 6 months? We don't want any statement later on, like "We didn't expect this to be taking longer, but that is the reality. We need six months more!" --"Authorities said Thursday some businesses were using the island's drainage system to send untreated sewage into its surrounding turquoise waters." Why were the island's drainage system send untreated sewage into the waters, in the first place? --"The environment ministry says 195 businesses, along with more than 4,000 residential customers, are not connected to sewer lines." If they are not connected to sewer lines where are the commercial and residential wastes being discharged? Who's telling the truth here? Could this clean-up means money to some group? politicized by the anti admin yes! Malay, Aklan Mayor Ceciron Cawaling said he is ready to face cases that might be filed against him as the Department of the Interior and Local Government is set to investigate the allocation of P1 billion environmental fees collected in 10 years from tourists who visited the famous tourist spot Boracay island. 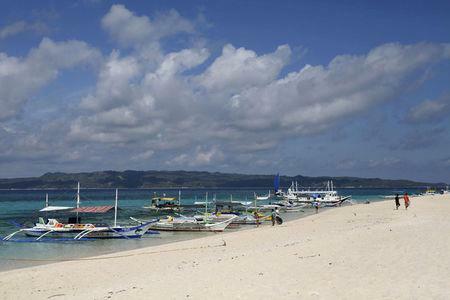 The DILG claimed the environmental fees should be reserved for cleaning Boracay's shores. The Aklan mayor is currently preparing the documents for the island's rehabilitation, according to a report on Unang Balita on Thursday. "Kailangan maging handa ka sa lahat ng mga mangyayari. But of course, ayaw kong makasuhan ako dahil gusto kong malinis 'yung pangalan ko bago ako umalis sa politika," Cawaling said. Of course the permits and passes will be approved and signed by the Pres. O ayan 6 months daw. Kaya ba ng mga checkwa? ^ six months? you can build a fully function house in six months but not a hotel casino. 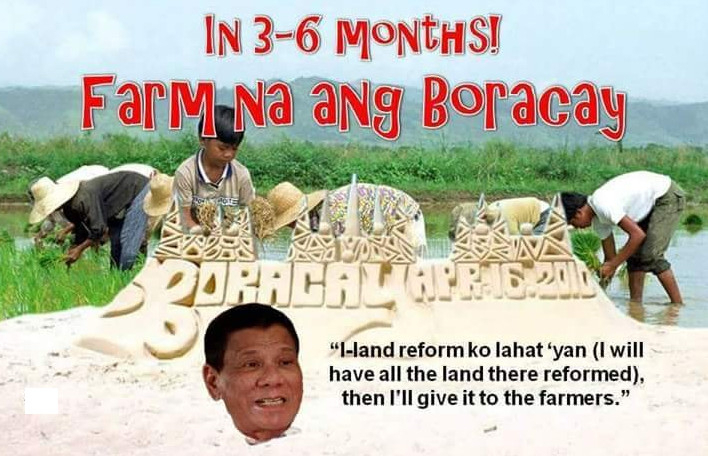 Mga balahura kasi ang mga businessmen dyan sa Boracay...mga ganid sa pera, mga salaula naman. Buti nga sa inyo, shut down kayo. ^ baka naman open to Mainland Chinese laborers? noon pa gusto gawin ng China iyan. they invest in the Philippines as long as Chinese laborers will construct the project. Malacañang defended the government’s approval of the construction of a $500-million integrated resort in Boracay even after the President Duterte’s order to rehabilitate the popular beach island due to environmental woes. 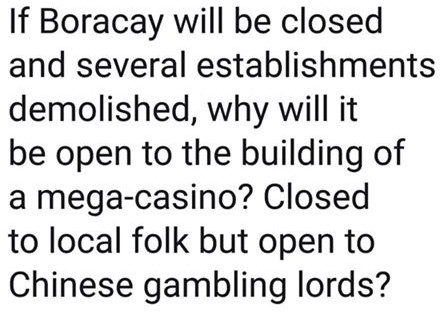 Presidential Spokesperson Harry Roque made the statement after netizens slammed the government for supposedly using Boracay’s environmental problems to close down and rehabilitate the island when its true intention is to prepare it for the casino-resort. Macau casino giant Galaxy Entertainment and its Filipino partner, Leisure and Resorts World Corp., are expected to start construction on a 23-hectare property in Boracay next year after they signed a provisional license with the Philippine Amusement and Gaming Corporation (PAGCOR). According to Roque, the size of the infrastructure will not matter as it will be probably required to have its own sewage treatment plan (STP), drainage system, and maybe even a zero discharge policy. “I don’t think so. Because if they build a facility as big as they want to build, perhaps the DENR (Department of Environment and Natural Resources) will require what Shangri La Boracay has, which is zero discharge,” Roque said when asked during the Palace press briefing about people’s sentiment that Boracay’s closure is for another reason. Zero discharge, according to Roque, refers to the reusing of all wastewater, treating it and reusing it either for flushing or gardening purposes. “So an establishment as big as this casino will probably required to have not just an STP, but the recycling treatment facility,” he said. “So the size will not matter as long as the necessary infrastructure are there,” he added. Roque said that Boracay is being closed down because the government aims for it to have a sustainable environment as envisioned by the former first lady Imelda Marcos. “Well, we’re fixing it so that it becomes a sustainable environment. It can be sustainable, it can support huge developments as it was originally envisioned during the time of Imelda Marcos,” he said. According to the Palace official, the Marcos government issued a Presidential Decree declaring Boracay as a tourism reserve. However, they failed to build the necessary infrastructure. “They should have built the infrastructure when Boracay was pristine. 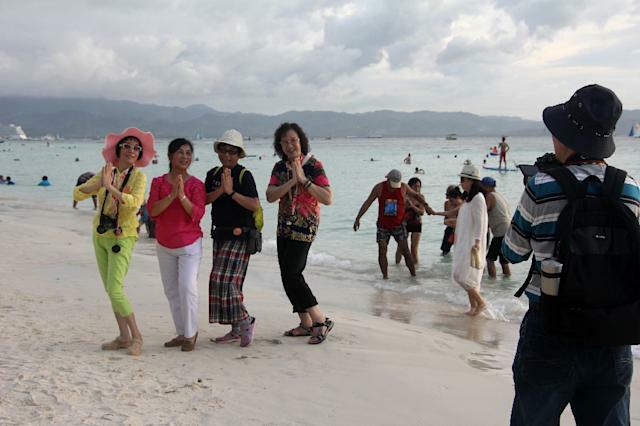 Perhaps they did not envision that Boracay would be the best beach in the world attracting this much crowd to day,” Roque said. Nakow....baka himatayin ang matandang yan kapag nakakita ng sangkaterbang seksi dun.